Line a greased 15-in. x 10-in. x 1-in. baking pan with waxed paper; grease the paper. In a large bowl, combine the pumpkin, sugars, eggs and oil until well blended. Combine the flour, baking powder, baking soda, cinnamon, ginger and salt; gradually add to pumpkin mixture. Pour batter into prepared pan. Bake at 350° for 20-25 minutes or until a toothpick inserted near the center comes out clean. Cool for 5 minutes before inverting onto a wire rack to cool completely. Carefully remove waxed paper. For frosting, in a large heavy saucepan over low heat, combine the syrup, egg whites and cream of tartar. With a portable mixer, beat on low speed for 1 minute. Continue beating until frosting reaches 160°, about 8 minutes. Transfer to a large bowl. Beat on high speed until frosting forms stiff peaks, about 7 minutes. Remove 1/4 cup frosting to a small bowl; tint with green and yellow food coloring and set aside. Cut cake widthwise into thirds. Place one layer on a serving plate; spread with a third of the frosting. Repeat layers. 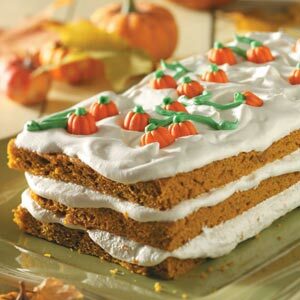 Arrange pumpkins on cake; add vines with the green frosting.